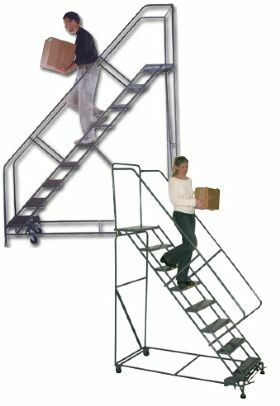 Nationwide Industrial Supply offers one of the largest selections of quality Rolling Ladders, Step Ladders, A-Frame Ladders and Extension Ladders. Quantity Discounts available. Government and Education PO's Welcome. CALL 1-800-757-1064. 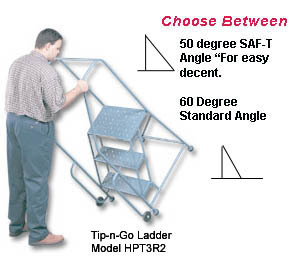 Features 50&deg; SAF-T angle as shown and priced. Easy, one person maneuverability in congested areas. 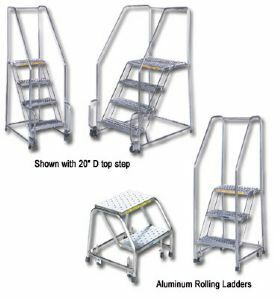 Available in either Grip-Strut or Perforated Step designs. FOB Shipping Point. Also available in 60&deg; Standard Angle &#150; Call for pricing. Features 6 casters for maximum mobility. 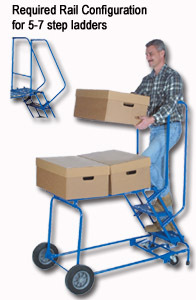 Includes 2-4" swivel front, 2-4" rigid back, and 2-6" rigid casters center. 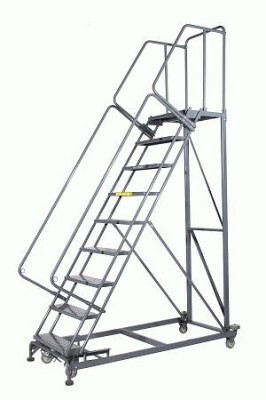 Handrails are 30" H. on 7-12 steps and 42"H. on 13-16 step ladders. Double deep top step. Ships KD. 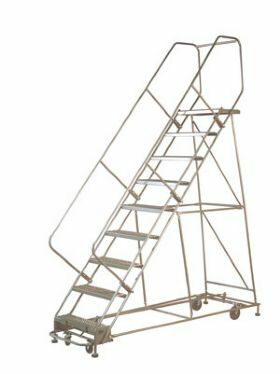 FOB Shipping Point.<BR><BR><B><I>New Package Guarantee</B></I><BR>GILLIS guarantees undamaged arrival of ladders (excluding paint finish/surface marks), which has been crated prior to shipment. If shipped via a GILLIS carrier, prepaid and add, we will file the claim and provide a 10% discount on the replacement order following proof of damage. 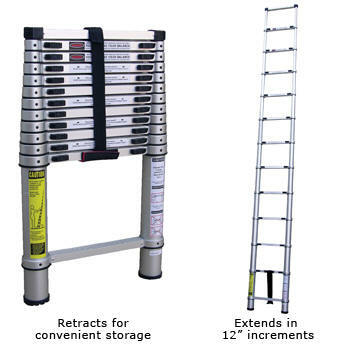 This guarantee is specific to crated ladders and can be terminated by GILLIS at any time without notice. Rugged, dependable and safe to use. 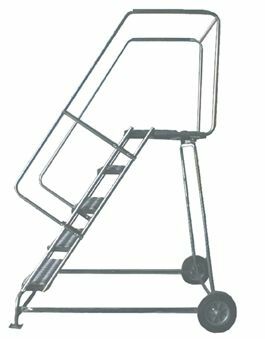 Features 58&deg; slope with 7"D. steps for safe, easy climbing. All welded construction for long wearing use. No hinge to break. Easy to maneuver in the open or closed positions. 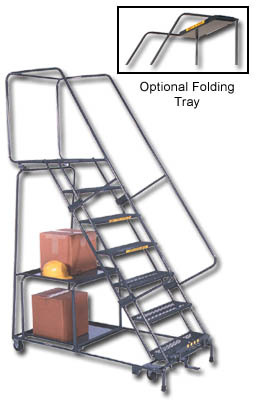 Locks in the folded or climbing positions for extra safety. Approx. 10"D. when folded for space saving storage. Built to ANSI 14.2 standards. FOB Shipping Point. 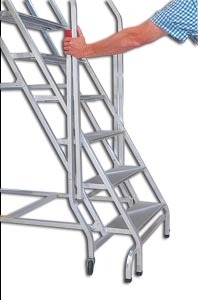 These stools and ladders are foot friendly with 180% more area on that important first step. Complies with OSHA and ANSI standards. Available in the following colors &#151; (AL) Aluminum, (BK) Black, (PT) Putty, (BL) Blue, (YL) Yellow, (WH) White, (RD) Red, (GR) Green, (BR) Brown, (GY) Gray &#150; please specify. No assembly required. FOB Shipping Point. Rugged and durable 350 lb. capacity. 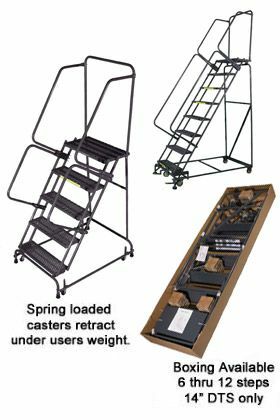 Spring loaded casters. 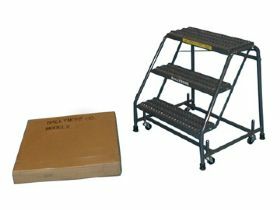 Available in slip resistant Abrasive Mat (R) or Perforated Step (P). No assembly required, Comes ready to work. Available in the following colors " Gray, Blue, Beige or Black. FOB Shipping Point. Built tough and sturdy. 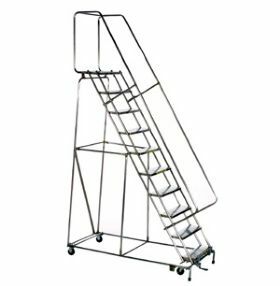 Features 24" wide design for narrow aisle use. Handles loads up to&nbsp;750 lbs. Includes expanded metal treads. 10" rubber rear wheels accommodate all surfaces. 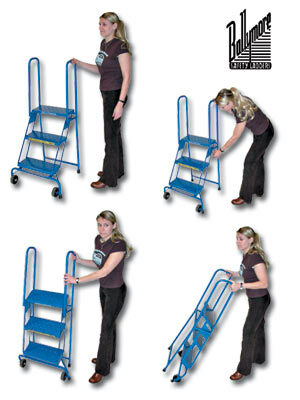 FOB Shipping Point.<BR><BR><B>HRLS</B> units feature lockstep with 2 standard 4" casters. <BR><B>HRM</B> units have lockstep with&nbsp;extra wide 1.5" x 4" casters. 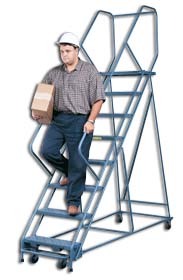 Ideal for every day maintenance work around the plant, warehouse or office. A handy organizer of tools and parts. 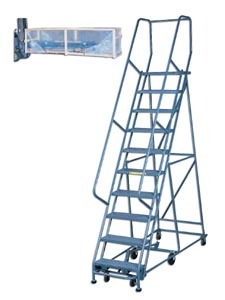 This unique cart is easy to maneuver around obstacles because the height dimension is greater than the length dimension, which reduces the turning radius. Metal perforated cabinet with hasp allows daylight inside to see tools and supplies. Strong structural integrity prevents break-ins. Black in color. FOB Shipping Point. 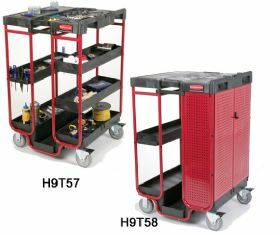 Unique "H" spreaders with hand grip on 4', 5' and 6' units. Pinch-Proof&#153; outside spreaders on 3',&nbsp;8' and 10' units. Blue, molded vinyl foot pads are riveted to aluminum foot brackets. UL Listed and Labeled. Meets ANSI and OSHA Code. FOB Shipping Point. Structural molded copolymer Tool-Tra-Top&reg; holds quart paint cans and tools -- slotted for paint roller tray. Handy bucket holder clip. 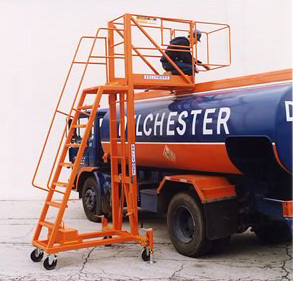 Internal steel spreaders protect against abuse, storage and transport damage. 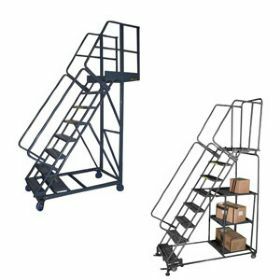 Double-riveted aluminum steps are deeply serrated for slip resistance. Combination rail end shield and shoe with extruded rubber slip-resistant foot pad. 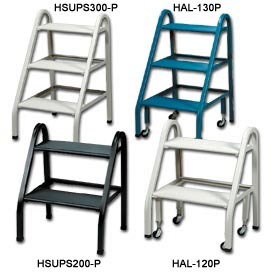 Front rails 3-1/8"W. Flange 1-3/16"W. Rear Rails 1-7/8"W. Flange 1-3/16"W. Steps are 3"W. Top is 5-3/4"W x 13"L. Meets ANSI and OSHA Standards. FOB Shipping Point. Features heavy gauge aluminum Tool-Tra-Top&reg;. 4 solid 1/4" aluminum rivet attach top to each front and back rail. Back-up aluminum plate reinforces all top connectors. Heavy-duty 1-1/4" inside aluminum spreader bars. 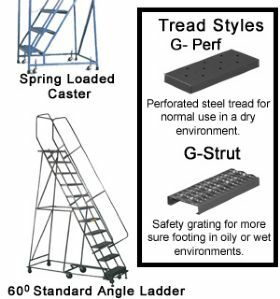 3-1/4" extra wide Traction-Tred&reg; deeply serrated aluminum steps, knee-braced and triple riveted. Full set of extra-strength knee-braced rear horizontals spaced one per foot. Lower rails reinforced with attached black non-conductive fiberglass rail shields to resist abuse. Combination rail end shield and shoe with extruded rubber slip-resistant foot pad. 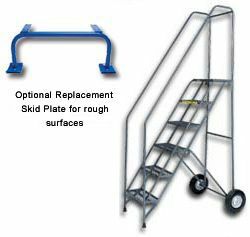 Front rails 3-3/8"W. Flange 1-3/16"W. Rear Rails 2"W. Flange 1-7/8"W. Steps are 3-1/4"W. Top is 7-1/4"W x 14"L. Meets ANSI and OSHA Standards. FOB Shipping Point. Traction-Tred&reg; 1-3/4"W deeply serrated aluminum flat D-rung. Polyethylene rung wear sleeves. Combination aluminum rail end shield and shoe with extruded rubber slip-resistant shoe pad and steel spur plate. Twist-Proof&reg; due to exclusive Alflo&reg; rung joints. Pre-pierced holes at top of fly for field installation of accessories. 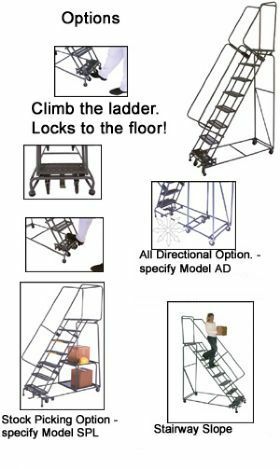 For ladders 40' rails are 4", flange 1-3/4", and flat type D-rungs 1-3/4".&nbsp; Fly section width for 40' ladders: 16-3/4" outside rail, 13-1/4" inside rail. 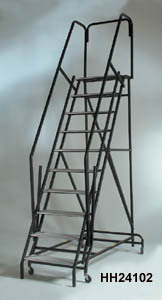 Base section for&nbsp;40' ladders 20-7/8" outside rail, 22" outside shoes. Meets ANSI and OSHA Standards. FOB Shipping Point. 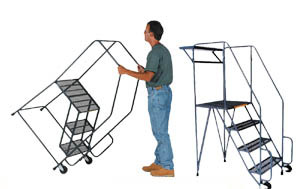 Lightweight and low profile design allows for storage in closets or tight spaces. 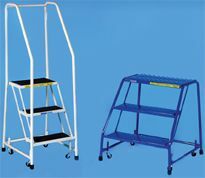 Each step is serrated and has a spring loaded locking pin that automatically engages to secure step height.&nbsp;The release mechanism provides a smooth automatic closing design.&nbsp;These ladders extend in 12" increments.&nbsp;Top bumper guards and molded rubber feet protect walls and floors against scratches.&nbsp;Meets OSHA and ANSI specifications.&nbsp;FOB Shipping Point. Mar-resistant molded black end caps and vinyl fly section shoes. Larger, stronger modified "I" beam side rails. Exclusive continuous rope and quick clip eliminates loose ends, knots and tangles. Large, smoothly operating extruded gravity/spring locks with spring activated nylon flipper. Full side rail 1/4" thick guide bracket at top of base, engages full fly rail. Guide brackets at bottom inside fly section for smooth operation and durability. Shu-Lok&#153; features hold shoes in spur position for penetrating grass, dirt, etc. 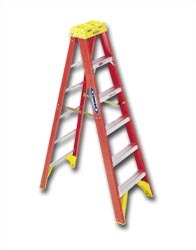 16-40' ladders; side rails 3"W, flange 1-1/8"W, D-rungs 1-3/4", base width 18" outside rails. UL Listed and Labeled. Meets OSHA and ANSI Code. FOB Shipping Point. Traction-Tred&reg; 1-1/2"W deeply serrated aluminum flat D-rung. Interlocking side rails. Internal guides on bottom of fly section and external guides on top of base section. Combination aluminum rail shield bracket and shoe with extruded rubber slip-resistant shoe pad and spur plate. Twist-Proof&reg; due to exclusive Alflo&reg; rung joints. Pre-pierced holes at top of fly for field installation of accessories. 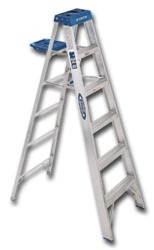 For ladders 16'-28' rails are 3-5/16", flange 1-3/16', and D-rungs 1-1/2". Fly section width: 16" outside rail, 13-5/8" inside rail. Base section 17-3/4" outside rail, 19" outside shoe. 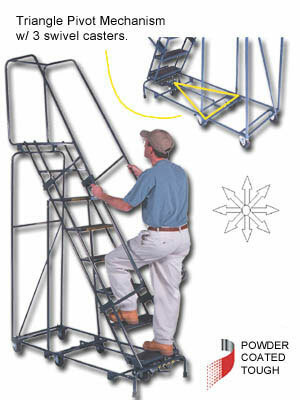 For ladders 32' and 40' rails are 3-5/16", flange 1- 3/16" and D-rungs 1-1/2". Fly section 16" outside rail, 13-5/8" inside rail. Base section 17-3/4" outside rail, 19" inside rail. Meets ANSI and OSHA Standards. FOB Shipping Point.